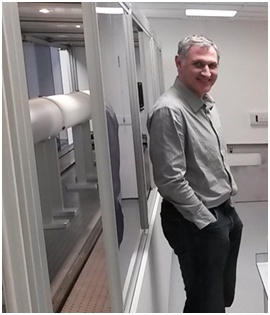 A Xeuss 2.0 UHR SAXS/WAXS equipment was installed in spring 2016 in the Department of Chemistry of the University of Sheffield. Testimony of Dr Oleksandr Mykhaylyk, Senior Scientist, Head of Soft Matter AnalyticaL Laboratory (SMALL) where the instrument is installed. “We are currently at the stage of learning and testing the instrument and at the moment we have seven users representing different laboratories from Chemistry, Physics and Materials Engineering. Having more than 15 years experience in SAXS with both synchrotron and laboratory experiments we always wanted to have a facility of this kind which would enable us to perform most of our measurements here in Sheffield with an access 24/7/365. A combination of MetalJet X-ray source, new 3D X-ray mirrors, scatterless slits and Pilatus 1M detector put us in a position where we can easily run SAXS measurements with resolution 0.001 Å-1 in the SMALL lab. Moreover, a design of the instrument provides us with the opportunity to run most of X-ray scattering experiments including SAXS/WAXS/GiSAXS/GiWAXS/X-ray reflectometry. “Sheffield is a centre of excellence for research in the fields of polymer science, soft matter and colloids and there is a number of groups at the Faculties of Science, Engineering and Medicine working across the field. Research interests include: copolymer self-assembly, hybrid latexes, colloidal nanocomposite particles, copolymer thin films, paint and ink-jet pigments, polymer crystallization, polymer liquid crystals, organic solar films, flow-induced phenomena (e.g. orientation, crystallisation, phase transitions), lubricants, lipids and biopolymers. In all this cases small-angle X-ray scattering (SAXS) is an essential characterisation technique. More information on the equipment can be found in the Xeuss 2.0 webpage. For more information on MetalJet sources, please click here.